There is little doubt that deflationary risks have increased in recent weeks, if only because the dollar has risen sharply against other currencies. Understanding what this risk actually is, as opposed to what the talking heads say it is, will be central to financial survival, particularly for those with an interest in precious metals. The economic establishment associates deflation, or falling prices, with lack of demand. From this it follows that if it is allowed to continue, deflation will lead to business failures and ultimately bank insolvencies due to contraction of bank credit. Therefore, the reasoning goes, demand and consumer confidence must be stimulated to ensure this doesn’t happen. We must bear this in mind when we judge the response to current events. For the moment, we have signs that must be worrying the central banks: the Japanese economy is imploding despite aggressive monetary stimulation, and the Eurozone shows the same developing symptoms. The UK is heavily dependent on trade with the Eurozone and there is a feeling its strong performance is cooling. The chart below shows how all this has translated into their respective currencies since August. 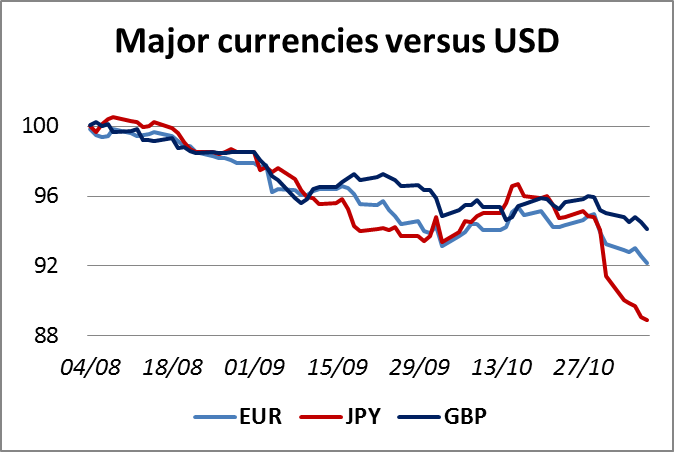 Particularly alarming has been the slide in these currencies since mid-October, with the yen falling especially heavily. Given the anticipated effect on US price inflation, we can be sure that if these major currencies weaken further the Fed will act. Central to understanding the scale of the problem is grasping the enormity of the capital flows involved. The illustration below shows the relationship between non-USD currencies and the USD itself. The relationship between the dollar’s monetary base and global broad money is leverage of over forty times. As Japan and the Eurozone face a deepening recession, capital flows will naturally reverse back into the dollar, which is what appears to be happening today. Economists, who are still expecting economic growth for the US, appear to have been slow to recognise the wider implications for the US economy and the dollar itself. The Fed, bearing the burden of responsibility for the world’s reserve currency, will be under pressure to ease the situation by weakening the dollar. So far, the Fed’s debasement of the dollar appears to have been remarkably unsuccessful at the consumer price level, which may encourage it to act more aggressively. But it better be careful: this is not a matter susceptible to fine-tuning. For the moment capital markets appear to be adapting to deflation piece-meal. Analysts are revising their growth expectations lower for Japan, the Eurozone and China, and suggesting we sell commodities. They have yet to apply the logic to equities and assess the effect on government finances: when they do we can expect government bond yields to rise and equities to fall. The fall in the gold price is equally detached from economic reality. While it is superficially easy to link a strong dollar to a weak gold price, this line of argument ignores the inevitable systemic and currency risks that arise from an economic slump. The apparent mispricing of gold, equities, bonds and even currencies indicate they are all are ripe for a simultaneous correction, driven by what the economic establishment terms deflation, but more correctly is termed a slump.